The film and leaflet advise that if you are caught up in an incident to ‘run, hide and tell’ – guidance which can be applied to many places and situations. 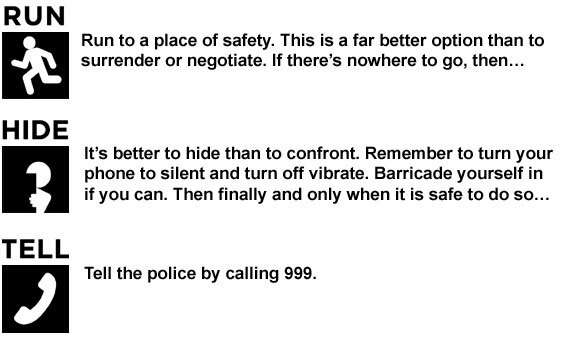 “Our advice has already been issued to tens of thousands of people during police-led security training sessions but it is only responsible that we issues this public safety guidance more widely. “With the threat level remaining at a high level, the police and security service continue to operate at a heightened state of readiness – we are working on hundreds of investigations and making an arrest a day. However, it is only with the ongoing support of communities that we can defeat terrorism – you are our eyes and ears so please be alert, but not alarmed. “We are asking everyone to remain vigilant and report any suspicious behaviour or activity to the confidential Anti-Terrorist Hotline on 0800 789 321 or in an emergency, 999. This entry was posted in Child safety, Law & Order, Public Safety. Bookmark the permalink.